Mark Webber looks well poised to claim victory in Sunday's Monaco GP after going fastest in qualifying. (CNN) -- Mark Webber is on pole position for Sunday's Monaco Grand Prix maintaining Red Bull's astonishing record of heading the grid for all six Formula One races so far this season. Australian Webber, who led from start to finish to win last weekend's Spanish Grand Prix, continued that form by blowing his rivals away around the iconic Monte Carlo street circuit. Webber clocked a quickest time of one minute 13.826 seconds to become the only driver to break the 74-second barrier during both qualifying and practice. 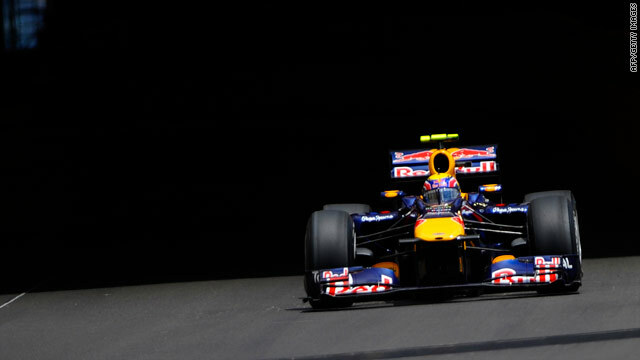 However, unlike in Barcelona last weekend, Webber teammate Sebastian Vettel failed to make it a 1-2 for Red Bull. Instead, Renault's Robert Kubica sprang a major surprise by joining Webber on the front row, recording a time just a quarter of a second behind the Red Bull. "But I think we can be very happy with our performance because we are in a great position to have a strong race tomorrow." Vettel is just a place behind in third position, followed by Ferrari's Felipe Massa and Lewis Hamilton's McLaren. The Mercedes cars of Nico Rosberg and Michael Schumacher finished sixth and seventh, with the top 10 completed by world champion and current world championship leader Jenson Button, Williams' Rubens Barrichello and Vitantonio Liuzzi's Force India. However, former world champion Fernando Alonso, who had dominated Thursday's two practive sessions, suffered a crash in final practice before qualifying and must start a lowly 24th and last on the grid.